London has a very long and unique history, which can be often missed in the hustle and bustle of modern urban life. 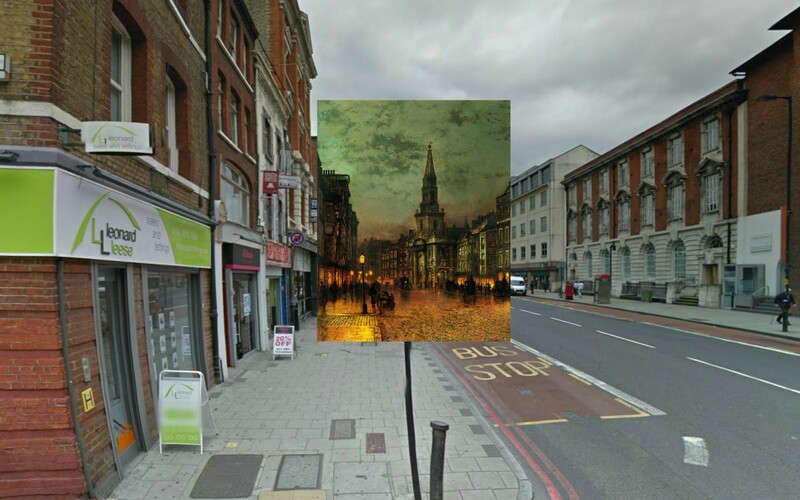 Art fan ‘Haldocherty’ on Reddit has painstakingly taken photographs of famous historical London landmarks and combined the with paintings from artists like Canaletto, William Logsdail, Balthazar Nebot and John Atkinson Grimshaw with some quite striking results. 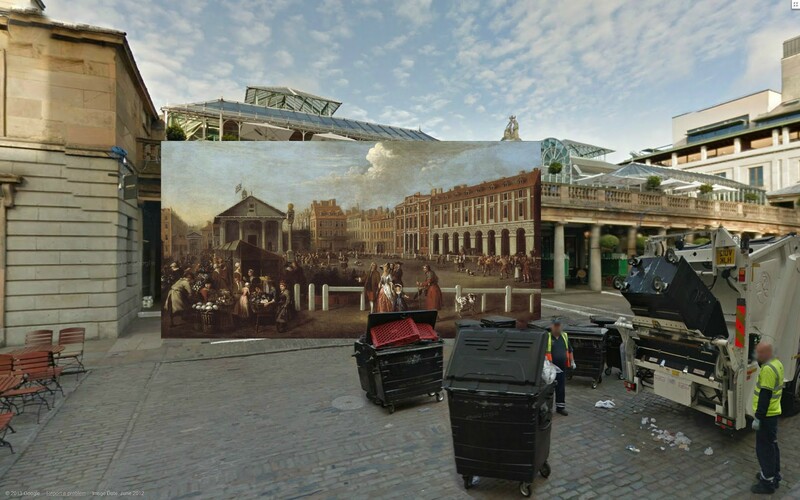 So next time you visit the likes of the ‘Millennium Bridge’ ‘Trafalgar Square’ and ‘Covent Garden Market’, spare a little thought for the rich and amazing history of London’s most popular attractions. 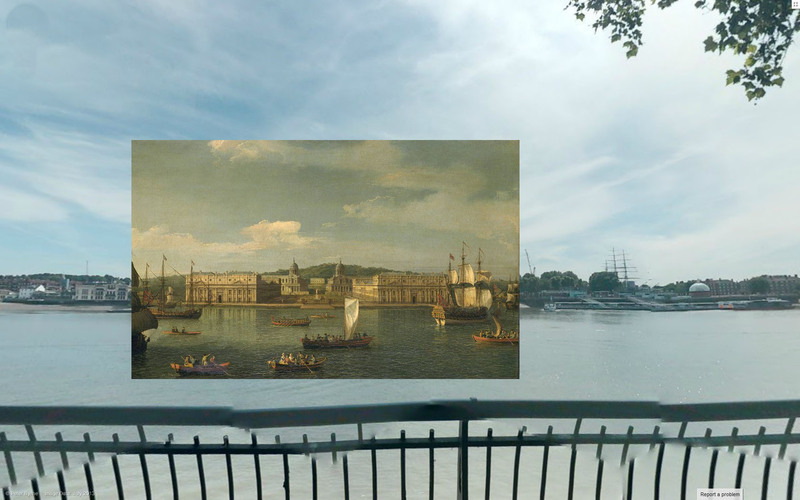 I love Canaletto’s paintings of London. This view hints at the less developed (and less painted) riverfront behind the Abbey the Knights are heading down to. 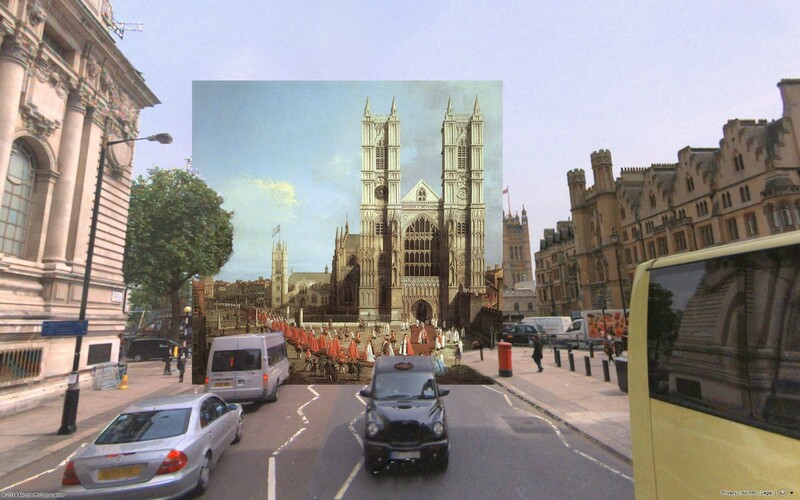 In 1749 Westminster Palace as we see it today wasn’t built yet, No Big Ben keyring for Canaletto. Members of Parliament were still using the Abbey’s Chapter House to have Commons meetings. On the South end of Trafalgar Square this huge townhouse stood from 1605 right up to 1874 when it was demolished after compulsorily purchase by Government to make way for a new road. There’s a Waterstones on the corner now under an old hotel building. Although it was completely demolished, one of the original building’s arches still stand, 7 miles away in East London as an entrance to a local community centre. 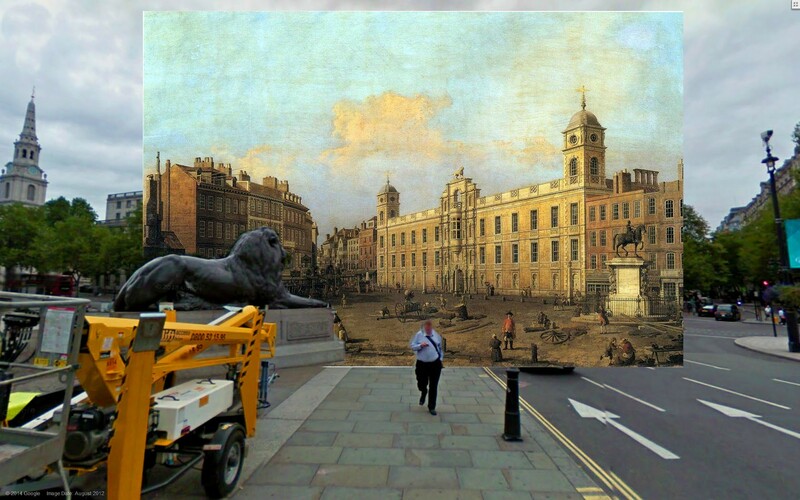 When this square was originally built in the 1660s it was the first open piaza of its type in London. Pretty famous as a red light district by the time this was painted. Today this view east towards St. Pauls Church is taken up by the Market Hall built in 1830. Theres a nice pub in the basement corner full of little cozy nooks. Gets pretty crowded. Not seen any hookers there yet. 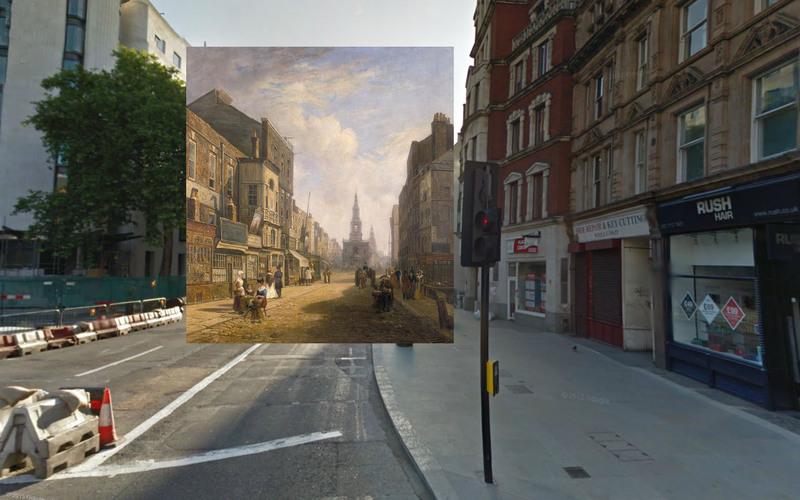 The Strand has changed massively since this painting of St Mary Le Strand. It was half demolished and widened in 1900 removing all the pokey alleyways and narrow residential roads to the North side. Even the church is a replacement for another one demolished to make way for Somerset House. In 1822 all the roads on the right would have still led right down into the Thames before the embankment was constructed. Most of those buildings are gone, but some of the roads remain and retain their slope down towards the old thames riverbank. On Villers St. the riverbank came right up to where Gordon’s Wine Bar is. 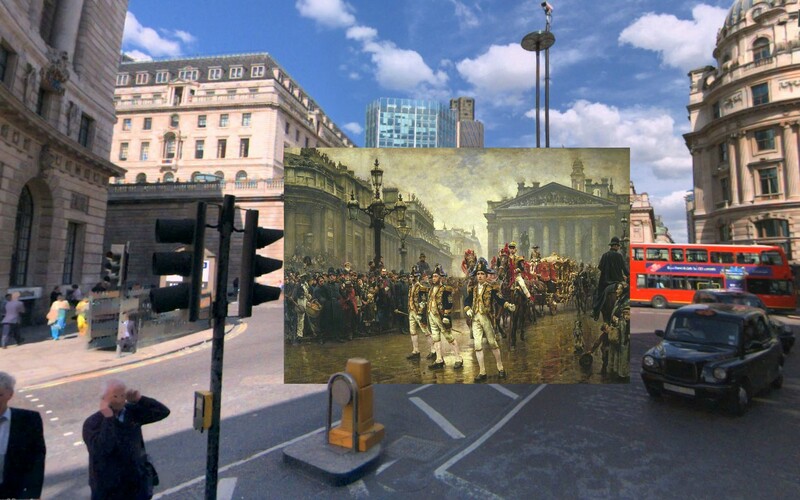 Another Lord Mayor’s Procession only 150 years later, passing through Bank Junction. To the left The Old Bank of England – somewhat underwhelmingly, the worlds eighth oldest bank – less than 50 years away from demolition. The Greatest Architectural Crime of the 20th Century in the City of London. A more famous crime on the very day of this parade was the last in a series of grizzly murders by Jack The Ripper. Less than a mile away too. If you look closely at the painting you can see another famous artist in the crowd wearing a brown bowler, JW Waterhouse, William Logsdail’s friend. 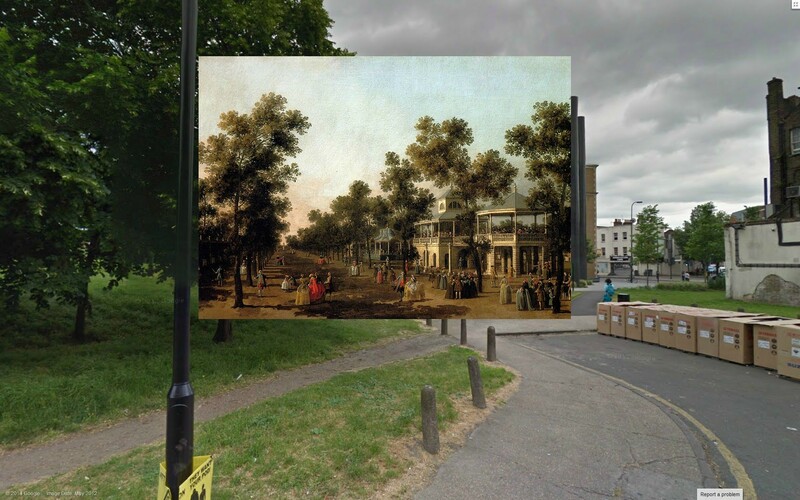 The Pleasure Gardens in Vauxhall were a big deal in the 1600s being a meeting place for all sorts of interlopers, wealthy rubbing elbows with working folk I guess. There was music and live entertainment and hot air baloons! Picking up hookers and working boys too by the time this was painted, which seems to be the pattern for most public spaces in London at one time or another. Better for gay clubbing these days if thats your bag. For literary fans this is the place where in Vanity Fair, Amelia’s brother somewhat fails to impress Becky by getting blind drunk on Rack Punch. The church is St. George The Martyr. Again for any literary fans, this is the Church next to the notorious Marshalsea prison where Dickens’ Little Dorrit is born. The only remains of the actual prison are tucked down an alleyway North of the church with a plaque in a small public garden. Today The Shard is the biggest spire you’ll see looking North East up Borough Highstreet. And one last Canaletto for good luck. Greenwich unchanged as ever, minus a few of the sail boats.